A mong the motorcycle set, Carmel Valley Road is a favorite ride. With the open- ing of Moto Talbott Collection in Carmel Valley Village, it's about to become a lot more popular. As anyone who knows him for any length of time is aware, Robb Talbott is nuts about motor- cycles, and has been since he was a boy. "I've been riding for more than 50 years," he says. His first bike was one that many young men cut their teeth on in those days, a Honda 50. "It was cheap and not very fast," Talbott recalls, "but it warmed up my blood." Today, he owns considerably more—and faster—motorcycles. To house them and share them with others, he designed the Moto Talbott Collection, slated to open late this summer. 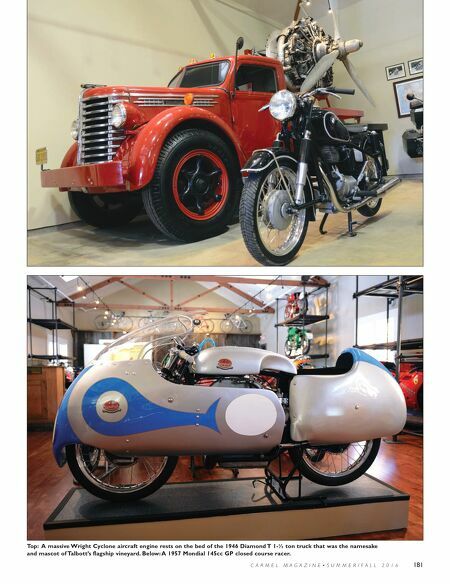 Located in the former Jan de Luz building in the heart of the Village, the Collection is 6,000 square feet of motorized heaven. More than 150 bikes are on display; more roll in all the time. Robb Talbott just can't say no to a cool bike. Especially if there's a story attached to it. Rober t Sharpe Talbott's parents Rober t and Audrey founded the Rober t Talbott Tie Company, where he worked in various capac- ities. In 1982, he and his father founded Talbott Vineyards and planted the first grapes on his Carmel Valley proper ty. After a successful run that saw the Talbott brand grow to worldwide renown, Talbott sold the business to wine giant Gallo in 2015. That gave him time to pursue his passion. "I'm a grandfather and I need to slow down," he says. After a split second's thought, he adds: "No. I'm not slowing down. If I'm not building Top: This 2006 Italian Agusta factory team race bike bears the signatures of all the proud factory workers who had a hand in its creation. 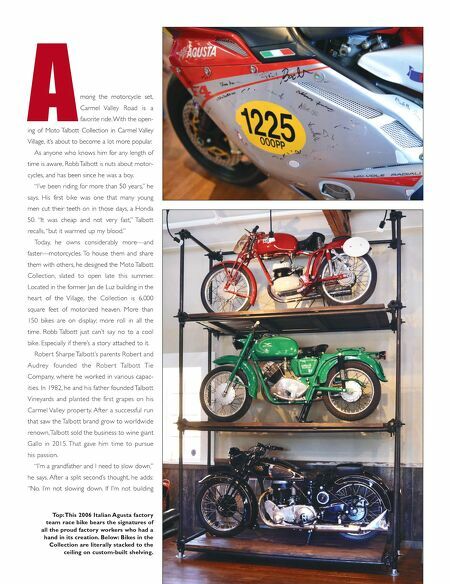 Below: Bikes in the Collection are literally stacked to the ceiling on custom-built shelving.